These images show the trailing hemisphere of Jupiter's moon Europa taken by the Galileo spacecraft at a distance of about 677,000 km. 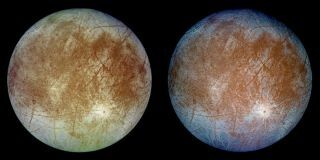 The left image shows Europa in approximately true color and the right image shows Europa in enhanced color to bring out details. The bright feature towards the lower right of the disk is the 45 km diameter crater Pwyll. Jupiter's icy moon Europa is thought to be hiding a saltwater ocean beneath its thick outer crust, an exciting prospect for scientists searching for extraterrestrial life in our solar system. A fresh look at decade-old observations from NASA's Galileo mission could help researchers pick the ideal spot to probe Europa in the future to get an idea of what's below its surface. "We have found the regions where charged electrons and ions striking the surface would have done the most, and the least, chemical processing of materials emplaced at the surface from the interior ocean," J. Brad Dalton of NASA's Jet Propulsion Laboratory, Pasadena, Calif., said in a statement. "That tells us where to look for materials representing the most pristine ocean composition, which would be the best places to target with a lander or study with an orbiter." Jupiter has the most powerful magnetic field of all the planets in our solar system at nearly 20,000 times the strength of Earth's. This field traps electrons and other charged particles including ions of sulfur and oxygen spewed from volcanic eruptions on Io, a neighboring Jovian moon. The particles in this field rush around Jupiter at a rate of about 10 hours per circuit, while Europa, which is about the size of Earth's moon, takes 3.6 days to orbit the planet in the same direction. And like Earth's moon, Europa has a far side that is always facing away from Jupiter's surface. This means it also has a back side that is constantly being smacked with speeding particles, which takes a toll on the surface chemistry. By looking at observations from Galileo's near infrared mapping spectrometer, Dalton and colleagues saw that there tended to be more frozen sulfuric acid at parts of Europa that had been more heavily bombarded with electrons and sulfur ions. "If you are interested in the composition and habitability of the interior ocean, the best places to study would be the parts of the leading hemisphere we have identified as receiving the fewest electrons and having the lowest sulfuric acid concentrations," Dalton said. The researchers believe these places are the most likely to have chemical compounds that originated from Europa's interior, and are not the result of surface chemical reactions. "The darkest material, on the trailing hemisphere, is probably the result of externally-driven chemical processing, with little of the original oceanic material intact," Dalton added. "While investigating the products of surface chemistry driven by charged particles is still interesting from a scientific standpoint, there is a strong push within the community to characterize the contents of the ocean and determine whether it could support life. These kinds of places just might be the windows that allow us to do that." NASA's Galileo spacecraft was launched in 1989 and finally arrived at Jupiter's system in 1995. It spent eight years circling the solar system's most giant planet before its mission ended in 2003. The new research was detailed recently in the journal Planetary and Space Science.